>KUNSTLER 2003 COLLECTABLE ORNAMENT – "SOLDIER OF FAITH"
Here for your consideration is the Timber Ridge School 2003 Collectable Christmas Ornament featuring Mort Kunstler's 2003 snow scene "SOLDIER OF FAITH." This is the 8th in a series of ornaments produced and issued by the Timber Ridge School. Those who personally knew General Robert E. Lee agreed that faith was the foundation of his life. “In sunshine and in storm, in victory and in defeat,” observed General John B. Gordon, “his heart turned to God.” A challenging childhood, the discipline of military life, the burden of command, the hardships of war — all were tools of grace that shaped and reflected the faith and character of Robert E. Lee. During the winter of 1863-64, Lee’s Army of Northern Virginia was in winter camp near Orange, Virginia and the general regularly prayed at the St. Thomas Episcopal Church. (His church pew is preserved and designated by a bronze plaque today, and an ancient locust tree outside had been the “hitching post” for his horse Traveler.) "SOLDIER OF FAITH" depicts Robert E. Lee outside St. Thomas Episcopal Church on the evening of February 15, 1864. This Christmas ornament was produced and issued exclusively by the Timber Ridge School, a licensed residential treatment center and accredited educational program serving young men between the ages of 11 and 19 with a history of serious emotional, learning, and behavioral difficulties. Funds for the improvement of campus programs and facilities are raised through the original sale of ornaments. 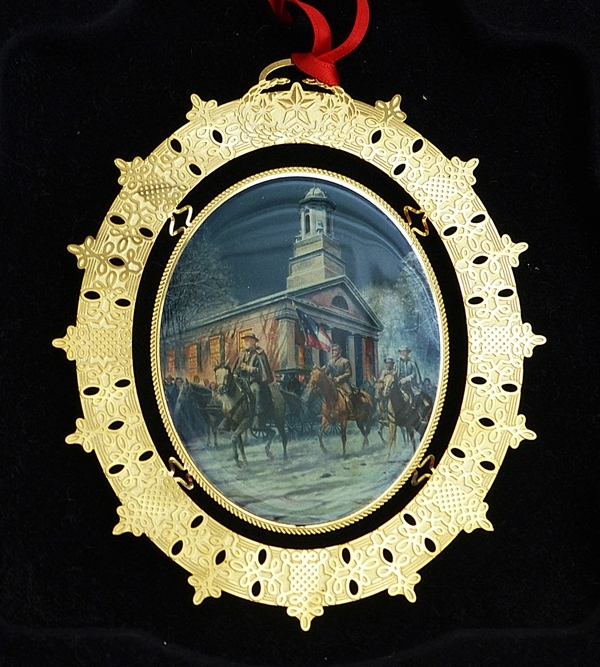 Mort Kunstler, a very generous supporter of the school, donated the use of his work "SOLDIER OF FAITH" for this ornament. No more than 7,500 of this 13th in a series of ornaments were produced. It has a 24 karat gold plated over brass border and is finished with red ribbon. It is packaged in a presentation box with black felt backing and comes with a numbered certificate of authenticity and an ornament stand so it can be either hung on a tree or displayed on a shelf.